Some people feel baking a cake is very daunting, lots of ingredients, lots of careful measuring etc. Here I will share a decadent chocolate cake recipe which is very easy to make. 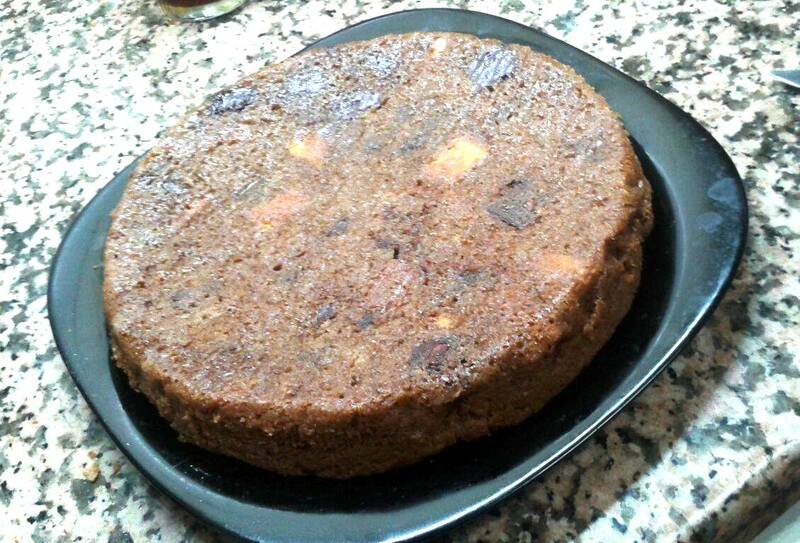 Its a one dish chocolate cake, with simple ingredients and no compications. Heat the oven to 175 degrees. Mix the flour, sugar. cocoa, salt, baking powder together. Mix in the eggs and stir. Mix in the butter milk and the oil and stir. Lastly mix in the boiling hot water or coffee and mix well. Pour into a greased cake tin and bake till a tooth pick comes out clean when inserted. Around 30–40mins. This is a savory spiced healthy crepe (chilla) that can be eaten for breakast, snack or even a light dinner. These oat crepes are easy to make and can be adapted to one´s own tastebuds. I served this with a tangy homemade spicy tomato chutney, but you can serve it with any chutney of your choice. These keep well in the fridge for a few days and can be also frozen. Making a batch seems like a good idea. So shall we start? Mix the powdered oats with the yogurt and all the rest of the ingredients.Make into a semi thin consistency adding enough water. Let it not be too watery. Leave to rest for half an hour . Heat a non stick gridle, pancake or dosa pan. Add a few drops of oil to it and spread ( i use a silicon brush). Add a huge serving spoon of this batter and spread it gently to form a thin round. Cook on one side , covered, (it will take about a minute on low heat ) then carefully flip and cook on the other. Drizzle oil on the sides to make it crisy. Heat the oil in a pan. Add the mustard seeds and let them splutter for 15 seconds, then add the coriander and cumin seeds. Let splutter for another 15 seconds. Then add the onion and sautee on low heat till transparent. Add the spices, and then the chopped tomatoes and cook till the tomatoes and soft and you can see the oil separating. Add tomato paste, sugar and salt to taste . Check and correct seasoning. Add chopped green chillies and coriander leaves . The tomato chutney can be made and stored in an airtight container for a week or more. To make it last longer you can add some white vinegar and more oil. You can use olive oil. Oats are among the healthiest grains on earth. They’re a gluten-free whole grain and a great source of important vitamins, minerals, fiber and antioxidants. Studies show that oats and oatmeal have many health benefits. These include weight loss, lower blood sugar levels and a reduced risk of heart disease. This has to be one of the most wanted récipes by the vegetarians or those who have an allergy to eggs. In Spain this is the most popular dish all over. The pity is the vegetarians cant taste it ! Well, here is the eggless versión of the famous tortilla de patata (or spanish omlette). Par boil the potatoes till 75% done. Cool and slice into rounds. Heat the olive oil in a non stick pan and saute potatoes together with the onions adding salt till soft and mushy. Cool the mixture. Mix the wáter,vinegar and gram flour together to make a thick batter. Add the baking poder and then put all the potato-onion mixture into this. Mix very well. The mixture should not be thin and runny. Heat some oil in the same non stick pan and when hot, add this mixture and shake the pan a bit. Cover the pan, and cook on low flame till one side is browned,. carefully flip over and cook on the other side as well on slow flame. Serve immediately while still hot. This is NEXT to the best thing! This is a real favourite with my family and an easy one pot dish. Its quick and nourishing at the same time. Heat the butter in a pan and take care not to burn it. Add the chicken pieces taking care they do not overlap each other and Brown on both sides after sprinkling with salt and pepper. Keep aside and in the same pan add the vegetables and sautee till cooked and still crunchy. Keep aside. In the same pan add the flour and sautee for half a minute and then slowly add the mik in it taking care the mixture is not lumpy. You need to keep on stirring non stop, add the stock, cube and stir. Once the sauce has thickened add the chicken and vegetables to it. Bring to a boil. If too thick you can add some more milk. Serve with the pasta seperately or mix the pasta into the sauce. For lactose intolerant please use soya milk or chicken stock. Vegetarians can omit the chicken. To spicen it up you can use siriracha sauce and chilli flakes. This récipe was inspired by many factors. The need to créate something new, the need to play with flavours and to please all of you. I keep on getting requests for non fried snacks, or practical récipes. I live my life by the clock, and am always cooking in a rush, but compromise on taste is a big NO ! 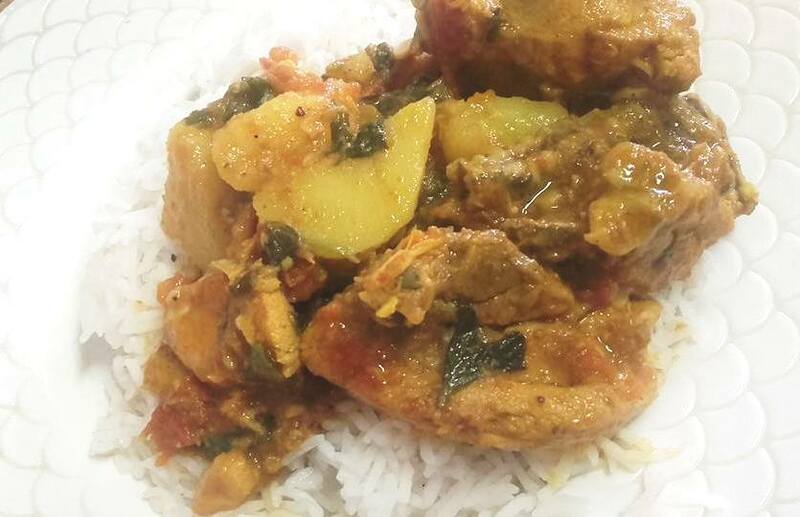 This récipe is easy, can be made with vegetables, paneer, tofu , fish, prawns etc. In my house we are huge chicken lovers, so I constantly cook it and try to do so in different ways. Blend the yogurt with the ginger, garlic and curry leaves . Add this to the cubed bonesless chicken with salt to taste and the tandoori spice. Marinate for a few hours or overnight. Heat a good non stick pan with the oil to smoking point ( i used my ceramic pan) and then add the chicken to this. I use a big pan so that the chicken pieces do not overlap each other. Once they are sizzling I add the butter and let them cook ( the aroma is AMAZING!). Once cooked on one side, I flip them over and cook on the other side. I add the Green chillies, and some chilli flakes if you want that extra zing ! Once the chicken is done add the grated cheese and let it melt. Serve hot sprinkled with coriander leaves . This is an excellent filling for wraps too ! VEGETARIAN VERSION: Follow the récipe replacing chicken with cubed vegetables, or paneer or tofu. For Jain versión, omit ginger and garlic. Salmon is a popular fish in Europe and recommended by doctors as part of our diet. Today I bring you a quick, healthy biryani. One associates biryani as a real rich dish full of nuts and ghee, but it doesnt have to be that way. I made this dish on the spur of the momento and I was amazed at how delicious it was! The salmon can be substituted for any type of fish, prawns, chicken or even vegetables. Blend the ginger, garlic, Green chillies, coriander leaves and yogurt into a paste. Add salt to taste . Marinate the salmon in this paste for about an hour. Meanwhile, grind 2 onions with 1″ piece ginger, 4 cloves of garlic into a paste. Heat 2-3 tablespoons of olive oil in a non stick skillet ( I used my ceramic pan) and fry the ground onion paste till well done (you will know its well done when it changes color and the oil separates from the paste. its very important that the paste is well cooked ). Then add 1 cup of tomato paste to this paste and mix well ( in spain we call this tomate frito). add some turmeric powder, chilli flakes and 2 tablespoons of home made garam masala to this. Cook till it nearly starts to stick and then add the marinated salmon with all the marinade. Check salt and correct. Cook covered till the salmon is cooked. Meanwhile boil 3 cups of washed basmati rice with a few bay leaves and cloves till about 80% cooked. Drain and then layer the biryani. Take a thick bottomed pot and start with a layer of rice, followed by a layer of salmon with the sauce, repeat this step till all the salmon is used up and you have a layer of rice on the top. Sprinkle coriander leaves and some mint leaves and cook on slow heat covered till thoroughly heated through. Serve it with a salad if you wish. It was so delicous and flavourful we did not need anything with it. 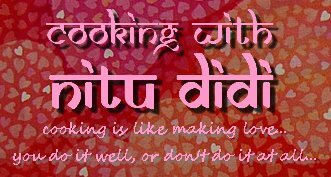 NITU DIDI TIP : for a richer biryani you can add nuts, raisins, etc. Ghee can be added in abundance instead of oil to make the masala. This is a fantastic way to eat salmon or any kind of fish and makes an excellent party dish or a one dish dinner. You can also use left over boiled rice to make this. There are no rules to cooking this , it all depends on how busy you are. “Dhabas” are small eaterys which are all over the highways in India. They are known for their distinctive style of cooking and people make it a point to stop by them and eat their signature dishes. Such is my dish for today. A simple chicken made in a record time of 15 mintues (if you have all the simple ingredients, which I am sure any household will). So..,.lets start the timer! Heat the oil in a pot and then add the washed chicken pieces. Add the salt and let the chicken cook on high flame till all the wáter dries up. Meanwhile grind the garlic and the ginger with the wáter to a fine paste ( I used my magic bullet) and add it to the chicken. Add the spices and potatoes and cook till you see the oil floating. Add the chopped tomatoes and cook till the tomatoes are all soft. By now the chicken and potatoes should be cooked. Add the coriander leaves, green chillies and chopped ginger and serve. You will be amazed by how delicious this is ! Cookies are easy to make! 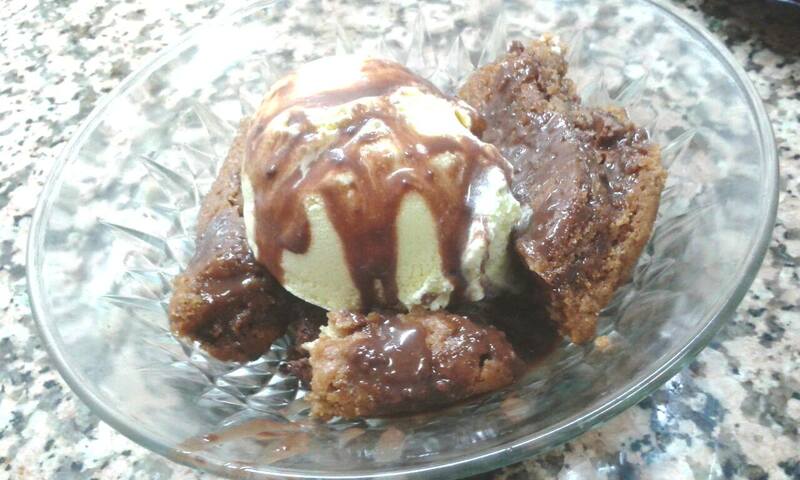 This all time chocolate cookie is a favourite in my home. What makes it “different” and luxurious is the fact that chocolate bits (not to be confused with chocolate chips) are used in this. You can use the nuts and chocolate of your choice. The cookie is chewy and yet crunchy with that melt in the mouth texture. Its always healthier to bake your own cookies at home instead of buying them. This way you know EXACTLY what your children are eating! I wonder if thats a good idea??? Hmmmm…!!! If you follow my simple instructions you can make this in no time ! Melt the butter in a saucepan over low heat till melted. Take care not to boil the butter, just heat it up til its all liquid. Remove from heat and stir in the Brown and White sugar. Then heat the oven to 180 degrees. Stir the butter sugar mixture for a minute and then leave it aside. Meanwhile chop the chocolate, nuts and measure out the other ingredients. Keep on stirring the butter and sugar mixture on and off till you get a caramel like consistency. Have patience, this is the only tedious part of the récipe. I sat down on the sofá and stirred it while watching tv. This should take you about 5 minutes ONLY, its totally worth it! Once you have the caramel like consitency you can now proceed. Mix the flour, baking powder and salt together. Add the egg to the caramel mixture and the vanilla essence and stir it well. Now add the caramel mixture into the flour mixture and just stir it for half a minute. Add the chopped chocolates and nuts but do not over mix. Grease and line a 10″ pie dish with butter paper (grease proof paper ) and pour the cookie mixture in. Bake it till the top is Brown and the cookie is done. To check if the cookie is done, insert a toothpick in, if it comes out clean, the cookie is done. Bring the milk to boil in a saucepan. Remove it from heat and add the chopped chocolate to it and stir. Put it back on heat till all the chocolate melts. Add more milk if you want a thinner consistency. This sauce will thicken when cooled. I simply love a good kabab. Its my weakness. I try and create different kinds of kababs playing with flavours each time. Tangdi kabab is a popular dish served in indian restaurants. Succulent melt in the mouth chicken legs are marinated and then roasted in a hot tandoor oven. The result is a tender and yet flavourful juicy bite of chicken. Well, I tried to recreate this amazing kabab for a barbecue party. 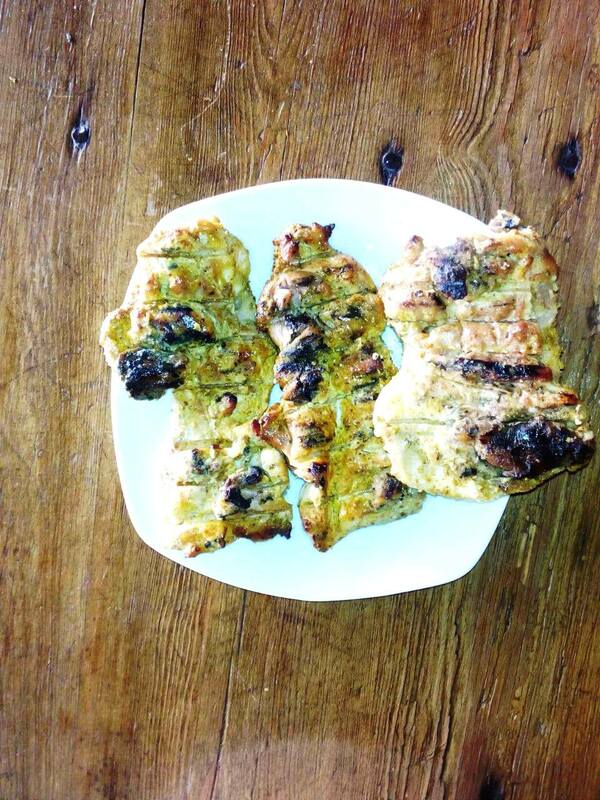 I decided to use boneless chicken leg and thighs for quicker cooking time and easy eating. My butcher deboned the legs and thighs for me to perfection. Ofcourse not all of you have a wonderful butcher like mine, so you can either buy boneless chicken thigh pieces at your supermarket or make it with the bones. Powder the ajwain (carom seeds) in a blender. I used my lovely magic bullet. Keep aside. Mix all the other ingredients with the powdered carom seeds and mix well. Marinate your chicken in this overnight. Next day heat a grill, or barbecue and grill till done and browned. Serve with a salad, chutney or any kind of roti and naan. Its absolutely delish and without a drop of oil! For those who want a restaurant taste can baste it with some melted butter. 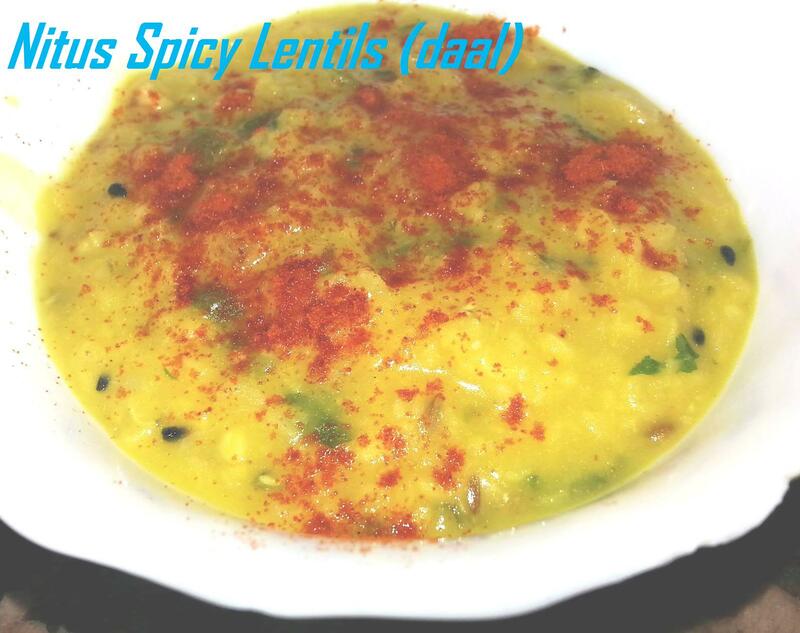 Daal or lentils are a staple food for many vegetarians being a great source of protein plus a somewhat comfort food. It is also a side dish. I like to make daal as its easy, and I always have left overs to give away ! Experimenting with different daals is a lot of fun for me. This recipe is a really different tasting one. I have used Nigella Seeds (kalonji) and whole coriander seeds in my tempering ( tadka). Boil the daal with 3 cups of water till absolutely done. Beat the daal when cooled with a fork or put it in the blender to make it into a thick paste. Heat the oil, butter or ghee in a pan and add the whole coriander seeds,let it splutter for a few seconds and then add the cumin seeds and let that splutter for a few seconds and lastly add the nigella seeds and immediately pour in the lentils. Add the salt, turmeric powder, green chillies and coriander leaves. Bring to a boil for a few minutes. Check seasoning and serve. You can sprinkle some red chilli powder as garnish. This daal can be the consistency you like, either thick to eat with rotis or thinner to have with rice. NOTE : Nigella seeds are very good for health and give a really different taste to this daal. Learn online cooking with me now! !